One glance at a menu here and you know you're in Louisiana even if you aren't familiar with all of the dishes. Here's a brief Louisiana culinary lexicon to help you decipher local menus. Barbecued shrimp -- Forget shrimp on the barbie or any images you might have of grilled shrimp with barbecue sauce. 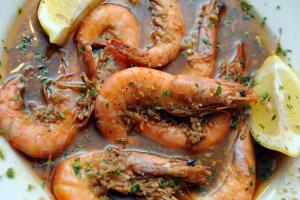 Here, barbecued shrimp means shrimp left in the shell and almost submerged in a garlicky, peppery butter sauce. It&apos;s messy. It&apos;s fattening. It&apos;s okay: Live a little. Poboy -- A long sandwich on crusty French bread, the poboy really isn&apos;t the same as a submarine or a hoagie, but it can be ordered with a variety of fillings. Among the favorites are fried oysters, fried shrimp and roast beef, featuring long-simmered beef, sliced and slathered in gravy. Order it "dressed," which means with lettuce, tomato, and pickle. Muffuletta -- Picture this: several layers of ham, salami and Provolone cheese topped with chopped olive salad served on a large, round, crusty Italian bread. Pronounced moof-a-lotta regardless of the spelling, this sandwich is a delicious handful and usually serves two or more people. Gumbo -- Though gumbo has popped up on menus across the U.S., you&apos;re not likely to get the real thing outside of south Louisiana unless it&apos;s cooked by a transplanted native. A dark, flavorful soup, real gumbo takes a long time to cook and requires a little voodoo to do properly; most gumbos are variations on two themes -- seafood and chicken and sausage. Served with rice, it can be light brown or dark as swamp water. Paneed -- Meaning coated in bread crumbs or dredged in flour and pan-fried in butter, as in paneed veal, chicken, frogs&apos; legs or oysters. Turtle soup -- A New Orleans classic, turtle soup these days often is made with chicken (so ask your server if it&apos;s the real thing). The dark, flavorful soup is typically enhanced by a dash of sherry added at the table. Cochon de lait -- Suckling pig is a favorite at Cajun family celebrations. Moist and flavorful, it&apos;s tender and, at its best, redolent of garlic. The cochon de lait poboy is a favorite at the New Orleans Jazz Fest and rarely served in restaurants (but occasionally you get lucky).